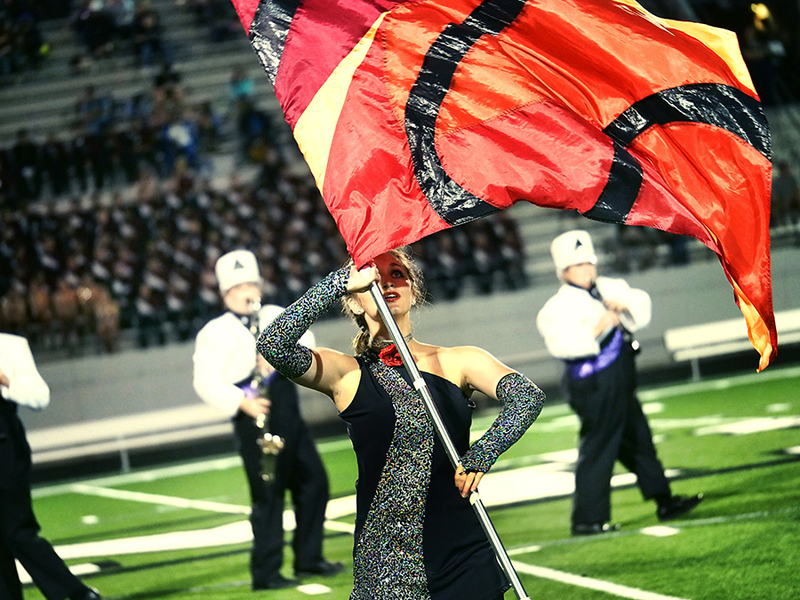 Assembled from many diverse performance backgrounds, the Colorguard presents a cohesive and entertaining visual display which enhances each Band of Knights performance. Guard members are proficient in marching band style spinning and perform with a variety of props including standard and oversized flags, swing flags, and rifles. The MGA Colorguard represents Middle Georgia's best and brightest students, always setting high standards and exemplifying the pride and spirit of Middle Georgia State! Colorguard auditions are held in the spring and returning members must re-audition each year. In addition to rehearsing with the Band of Knights, the Colorguard rehearses on Monday evenings and Saturday mornings on game days. All Band of Knights Colorguard members are expected to attend our Preseason Band Camp and all Band of Knights Marching band rehearsals. Please fill out the registration form on this website to add your name to the mailing list. Band camp registration is included as part of the registration form linked to this website.